First about the assemble: The Quartz crystals are formed like an „L“. The Fluorite group is resting on the horizontal Quartz crystal and not inter grown to the vertical one. 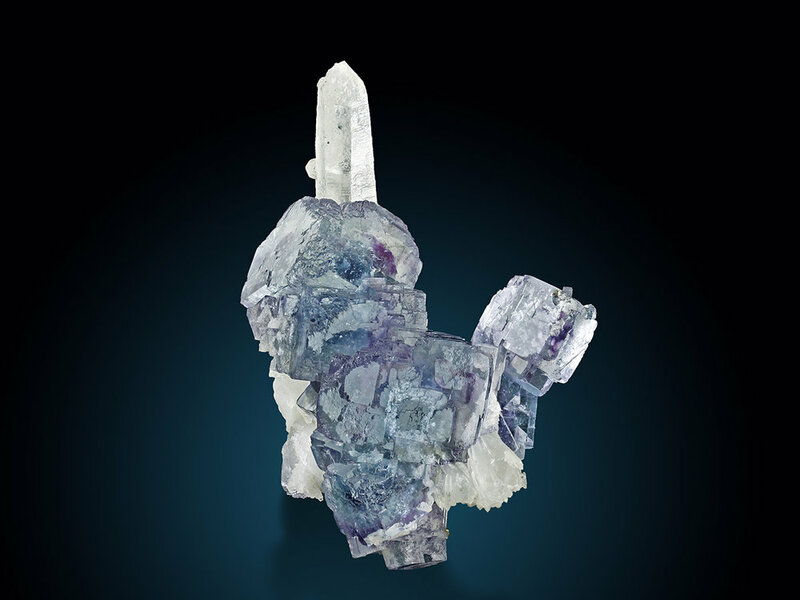 The Fluorites are freestanding, well developed all around – specimen is developed as floater. The Fluorite crystals are glassy, highly lustrous and show purple phantoms. The outer zones appear in steel-blue color, the luster is excellent. The crystals show cubic habit with sharp terminated stepped modifications at their corners. The photos just give you an idea of the perfect quality and of the crazy and tridimensional assemble – in person it is so much better! All is perfect, no damage, no contact and all indicators are on highest level. Even for China this is not common, this quality and this aesthetic assemble is hard to obtain.